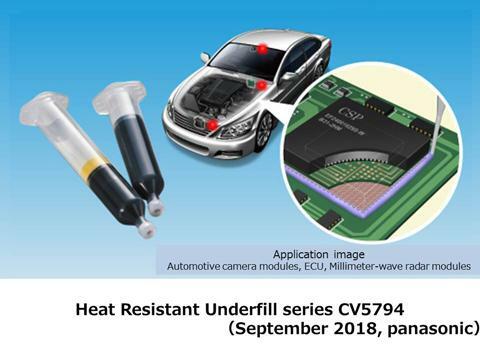 Osaka, Japan - Panasonic Corporation announced today that it has commercialized temperature resistant secondary underfill  series CV5794 for automotive electronic applications. Mass production is scheduled to start in October 2018. Automotive electronics are becoming increasingly sophisticated and ubiquitous. Advanced Driver Assistance Systems (ADAS), In-Vehicle Infotainment (IVI) and other systems are challenging the current design and reliability capabilities of semiconductor packaging and circuit board assembly processes. Advances in functionality and processing speed are driving increases in package size and a proliferation in the number of semiconductor package to printed circuit board connections, resulting in smaller and more tightly spaced solder interconnects. These fine-pitch connections require reinforced underfills to achieve the rigorous reliability requirements of the automotive industry. By employing a unique resin technology, Panasonic has developed a series of heat resistant underfills capable of meeting these requirements. Reinforcement of surface mounted semiconductor packages and other electronic components; for example, automotive camera modules, communication modules (millimeter-wave radar modules), ECU (electronic control unit), and next-generation cockpits/IVI (next-generation vehicle communication systems). Surface mounted semiconductor packages in automotive systems need to tolerate an extremely wide range of temperatures. Underfill materials used to reinforce these components must exhibit excellent heat resistance to maintain the mechanical and electrical integrity of solder joints at elevated temperatures excursions. Materials with higher glass transition temperatures (Tg) generally perform better in this regard. Additionally, underfills with lower coefficient of thermal expansion (CTE) values reduce the stress exerted on the interconnects during expansion and contraction resulting from temperature transitions. However, it is difficult to concurrently achieve the high Tg and low CTE properties needed to increase the heat resistance of automotive underfills. 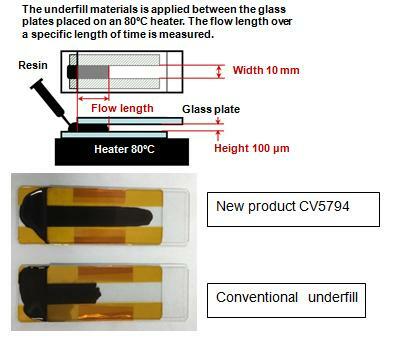 Heat Resistant Underfill CV5794 has a low CTE (20 ppm) while delivering a high Tg (180ºC) using Panasonic's unique resin design and reaction control technology. The combination of these properties results in reduced CTE difference between the underfill and circuit board, thereby reducing the stress exerted on solder balls . Even after 5000 temperature cycles, with a lower temperature of -55ºC and an upper temperature of 125ºC, the Heat Resistant Underfill CV5794 exhibited no peeling or cracking demonstrating the reliability of solder joints reinforced with this new product. As functionality, speed and power of automotive electronic systems increase, so does the size of semiconductor packages. Incomplete filling and underfill voids have a detrimental effect on board-level reliability. Complete filling of large areas with high I/O counts and small gaps is challenging for conventional underfill materials. This new material has achieved a high flow rate by using Panasonic's resin design and filler control technologies and is capable of underfilling semiconductor packages of 20 mm x 20 mm or larger. Due to their chemical stability, conventional underfill materials require frozen shipping and storage. These handling requirements result in cost and scheduling burdens for both manufacturers and users. Additionally, frozen underfills typically require 1-3 hours of thawing at room temperature before use, potentially creating manufacturing bottlenecks. Formulated using Panasonic's unique reaction control technology, this new product requires only refrigeration (5ºC), rather than freezing. This feature eases customer handling requirements, thereby reducing cost and increasing manufacturing flexibility. A secondary underfill is a reinforcement material that retains and improves the reliability of component to circuit board interconnects. The material, which is a liquid resin, enters between a board and semiconductor package, is dispensed around the package, flows into the space between the package and the circuit board via capillary action. After curing, the material hardens into an insoluble and non-melting material. Glass transition is a transition phenomenon in which a material such as a polymer, when heated, changes from a hard glassy state into a soft rubbery state. The temperature at which the glass transition occurs is called the glass transition temperature. The CTE is a ratio that describes the increase in length, at constant pressure, of a material per unit temperature within a temperature change. It is an important characteristic that affects mounting reliability. Solder is an alloy used to solder (join) metals such as electronic parts. Solder is used to anchor a semiconductor package or electronic part to a printed circuit board, at the same time keeping the terminals of each component electrically connected so that electrical signals can be exchanged between them. A solder ball is a spherical solder droplet pre-attached to the package for attachment of a single-side-sealed package, such as a ball grid array (BGA).